Every journey has a reason. I’ve flown all the way to Argentina to celebrate Malbec wine, and to Bhutan to learn about responsible tourism. Sometimes the purpose of our travel is clear. There’s an article to be written. There’s a chef to be interviewed. But other times, the reason surfaces as your journey progresses. 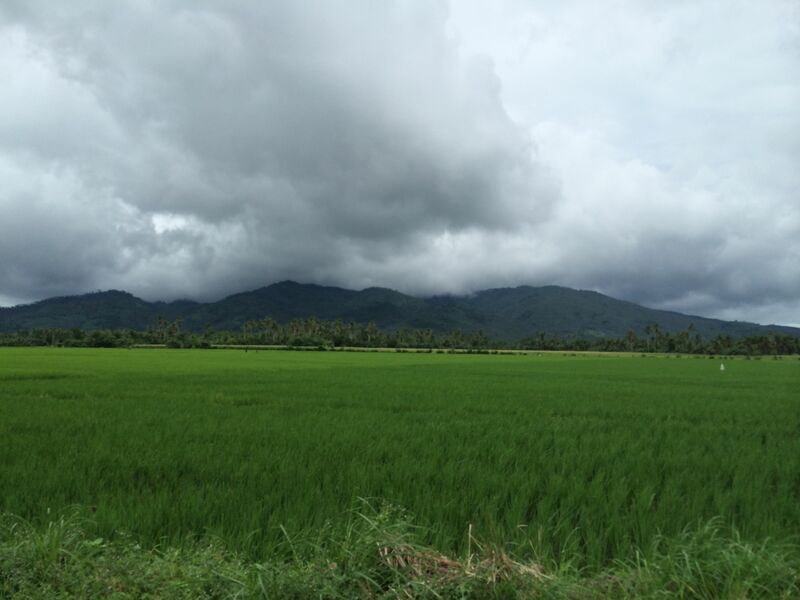 Last week, I went took a trip to Pinamalayan, Mindoro, the hometown of my paternal grandmother. My grandmother was once Miss Mindoro. It made me smile to know she was both a beauty titlist and a female professor of Zoology at the UP. She had both beauty and brains. My mission in this trip was to take care of some matters for my family. Not an easy task, but luckily, I was in the company of my third cousins: Aileen and Andy. They lovingly treat me like a younger sister. And we enjoy each other’s company. I’ve always thought we were second cousins, because they were always part of my life. Only in this trip did I learn we were third cousins. But because I like them so much I’ve they will always be my first cousins. Pinamalayan is a small town with a population of only 82,000 people (based on the 2010 census). Much has changed since my last visit in the early 90’s. The ferry now is much improved Fastcat ferry. It is definitely much better than the RoRo I rode before. It is definitely faster. It is more stylish with a business class section, and movie screenings. There are no longer people offering manicure and pedicure services on board. Arriving at Pinamalayan, the town has definitely grown. There are now more shops. The roads look wider and busier with more cars and jeepneys. There’s even a Jollibee, a Mang Inasal, and a soon to open Red Ribbon. My cousin Andy reports though that the town still has no escalator. The idyllic ricefield scenery still exists in Pinamalayan, Mindoro. 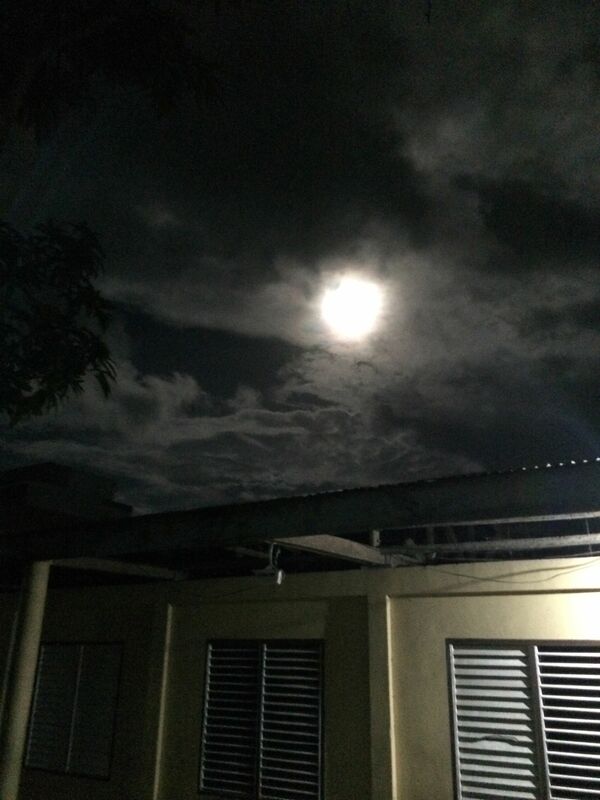 Amorsolo would approve! I was not here to assess modernity. But one cannot help but compare. My perspective has shifted too from a family trip in the 90’s to this visit as an adult in my 40’s. It has changed, so have I. Amidst the town’s progress and modernity, I admired the few remaining heritage homes in Pinamalayan. Two houses still standing at the heart of downtown Pinamalayan belong to my relatives. As we drove around town, I marveled at the schools, including Abada (run by my cousins) with all classrooms air-conditioned and even archery for PE. The nursery had not only miniature chairs and tables, but also tiny toilet and sinks. (Oh, how I felt like a giant). I was even fascinated by how one senior high school in Pinamalayan had sailor moon inspired uniforms, with knee socks to boot. Talk about stylish! At mass, I felt the warmth of a small town parish. Everyone knew each other. The parish priest shared during his homily how he genuinely missed his flock when he traveled. His sentiments seemed really sincere, as he lingered for a long time after mass to connect with the parishoners after mass. The hub of the town is still the public market, with the frenzy happening on Wednesday, with most vendors present selling their supply of produce for the weekly bazaar. Our meals were made fresh daily from meat from the public market. The cook, Daniel, was a hunky 24-year old guy. 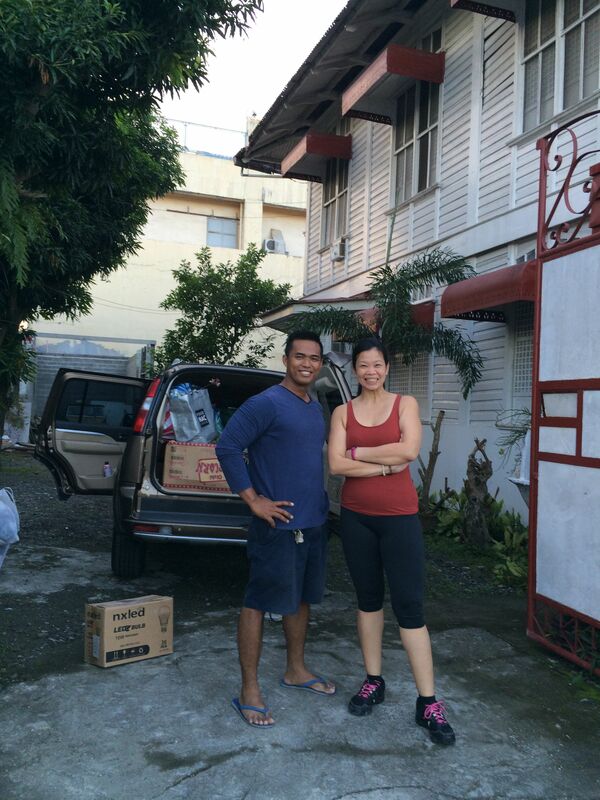 He was not too macho to do market shopping before dawn, or to cook authentic Filipino meals. He made Bistek (beef with onions, marinated in soy), and Nilaga with freshly slaughtered meat cabbage, corn, saba(Philippine cooking banana), and kamote (sweet potato). But his piece the resistance for me was his Kare-Kare. For most Filipinos, Kare-Kare means an oxtail stew made with peanut and ground rice, plus eggplants, string beans, banana palm and other vegetables. What shock I had when Daniel served us a plate the Mindoro Kare-Kare, think of it as Dinugan (pork blood stew with banana palm). It was absolutely delicious. Just the right sourness and flavor! I was so impressed with Daniel and want to make him the poster child for all Filipino men. In my head this is how the modern Filipino man should be: kind, respectful, fit, and a great cook. I wish his tribe would increase all over the archipelago. Daniel, my poster boy for the ideal Pinoy Macho Man: Goes to the Market at Dawn, Cooks Well, Kind, and FiT! One unique find was Nanay Goya’s Garden Restaurant, which served typical Filipino dishes like Sinigang, Adobong Kang Kong, and Crispy Pata in an alfresco setting. Don’t miss out on my favorite dish there, the Tofu Inasal. I’ve always loved the flavors of grilled Chicken Inasal. 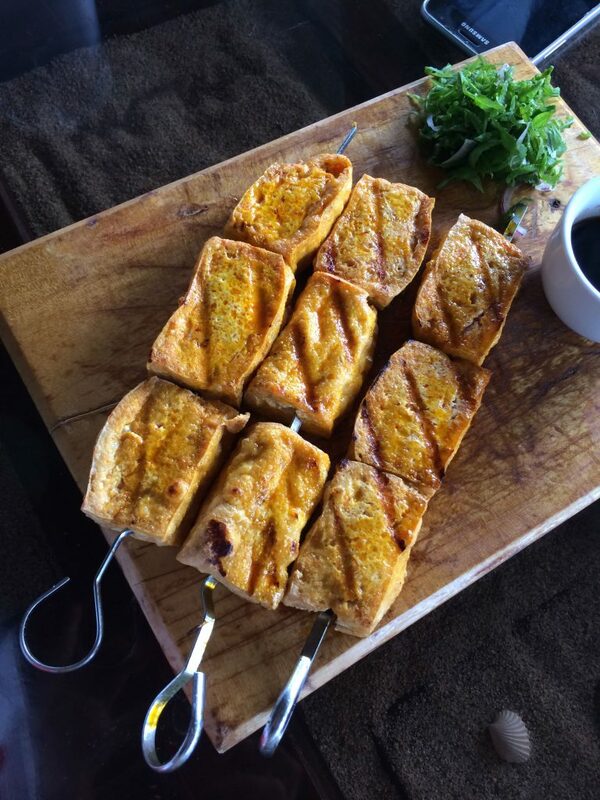 Cooking cubes of Tofu in Inasal Marinade and serving it with the same sawsawan (sauce) made of soy sauce, calamansi (Philippine citrus) and spiced vinegar, is genius. It is so simple, but so delicious! 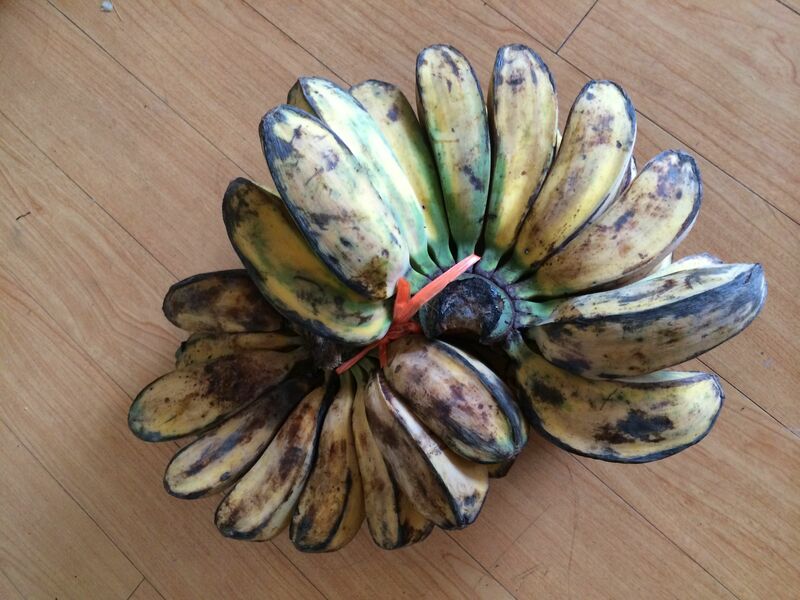 Pinamalayan is known for its bananas. They have the best Saba, cooking bananas. 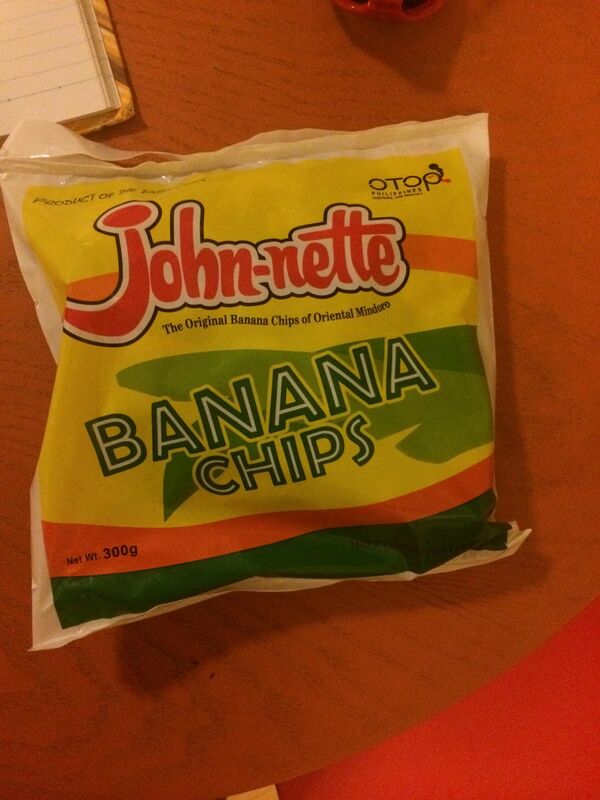 And growing up, John-Nette banana chips were the favorite pasalubong from Pinamalayan. I always had a pack, my officemates often teased my dad must be John and my mom, Nanette. Not true at all! But the banana chips are really delicious, not too sweet, and not at all oily. Every bite is crunchy and so addictive. Before you know it, you’ve finished a pack. 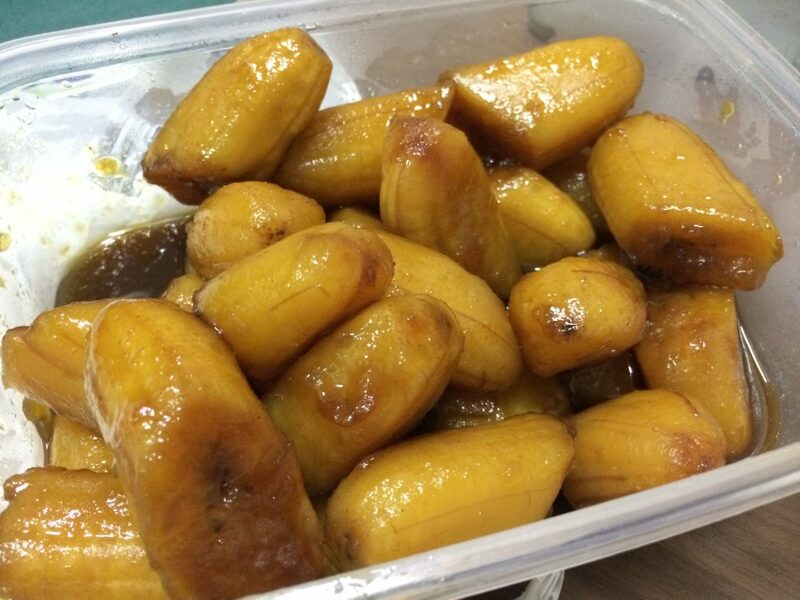 Aileen’s favorite is the Sinolbot, which is minatamis na saging in Tagalog. 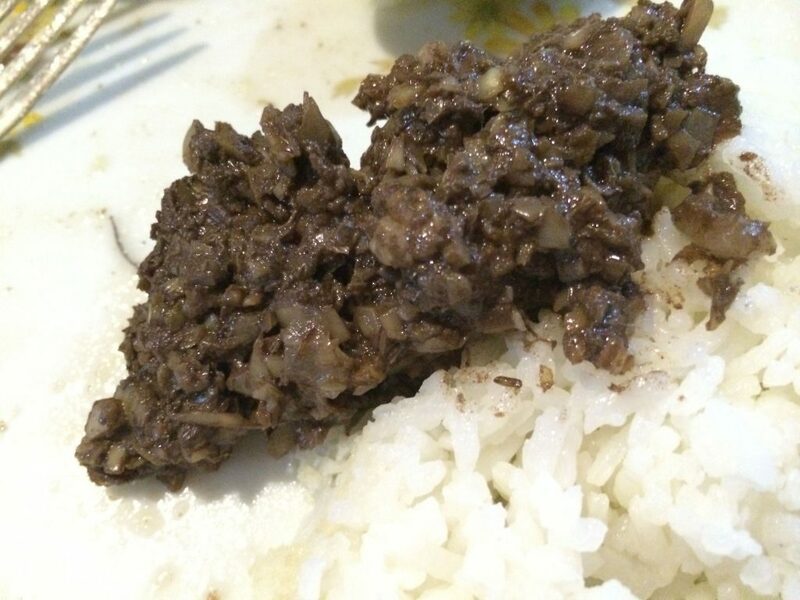 The saba is cooked in brown sugar. But this saba is chewy and not at all soggy. They tell me the trick is in using white saba bananas, abundant in Mindoro. Pinamalayan’s famous Saba (cooking bananas), but I prefer eating them raw. I brought these home! You get to know a place through its people. While you may read as much as you can about a place, you learn its true essence from its people. As I stayed for a few days, I got to know the locals of Pinamalayan. Surprisingly, I expected to be introduced as the granddaughter of my beauty titlist grandmother. Instead, my cousins often said, “Apo siya ni Lola Choling,” (The Granddaughter of Granda Choling). The locals nod their head, and have a knowing look. Lola Choling was my paternal grandmother’s younger sister. They knew her in Pinamalayan for riding solo on horseback while holding her rifle. Yes, she was one tough woman! Later, when she got older she rode a tricycle instead. The image of her on that horse and her riffle was so powerful to the local folk, but more so to me. “So I guess the fierce strong woman” was really in my genes. 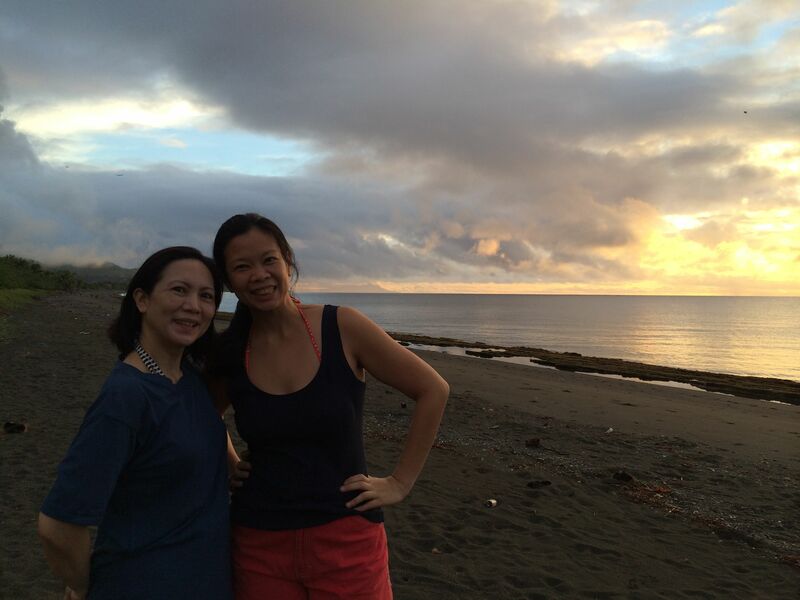 The day after the Supermoon, my cousins and I headed to the beach of Pinamalayan for a swim at dawn. Arriving in time for sunrise, the only other people on the beach were the fishermen. The sand is not white. But the charcoal grey sand was powdery soft and fine like Boracay’s. As I stepped into the water for a swim, I looked up at the sky to see a Rainbow. It was a full glorious rainbow from end to end. If only Lola Choleng could see me now! Andy later tells me the legend of Pinamalayan. The name comes from the word, “Ipinamalay na” meaning it has been made known, or to make aware. 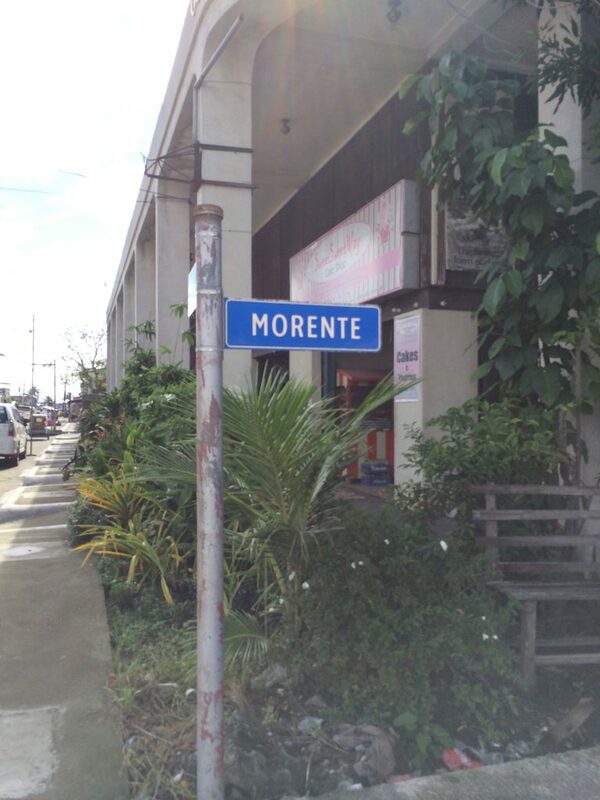 The early settlers were said to have come from Marinduque. 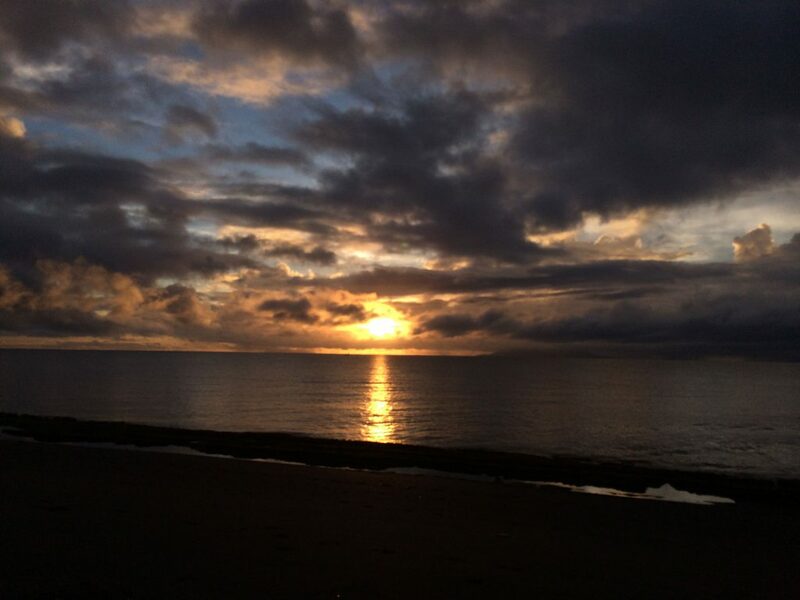 On their way to Mindoro, they encountered turbulent weather and lost their way. They prayed for deliverance and guidance. Their prayers were answered. The weather cleared and a rainbow appeared on the horizon guiding them to this abundant land. 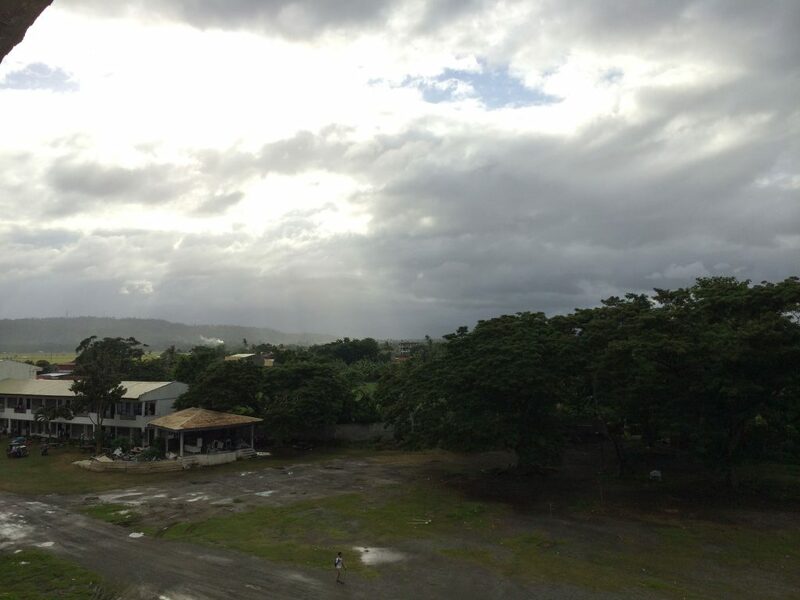 They cried, “Ipinamalay na.” The rainbow led them to Lumambayan, where they settled. With good soil, they prospered in the very coastal area where we swam. This promised land is the land of my ancestors. 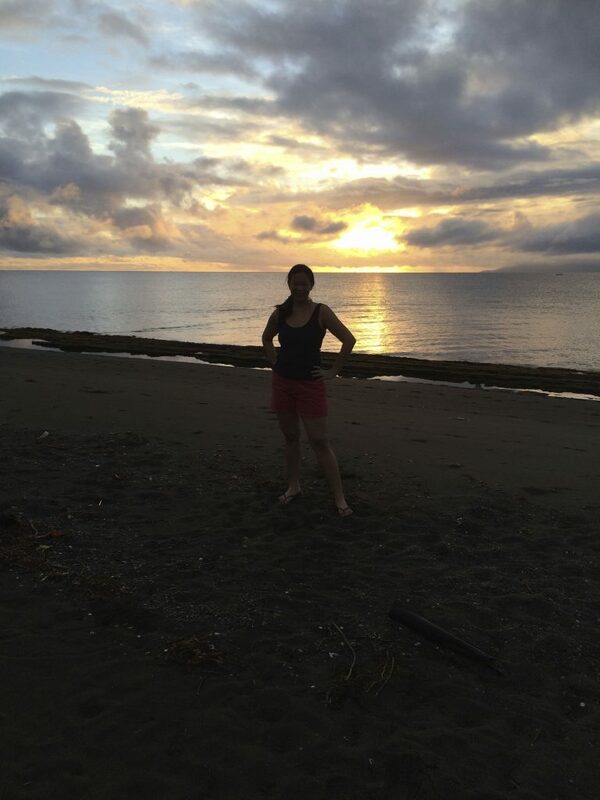 Of sunsets and rainbows… at Pinamalayan Beach (Unfortunately, I have no photo of rainbows as I was swimming when it appeared). Later that day, as my cousins and I went about doing our errands, Andy drove through soft mushy land. Our vehicle got stuck deep in the mud. 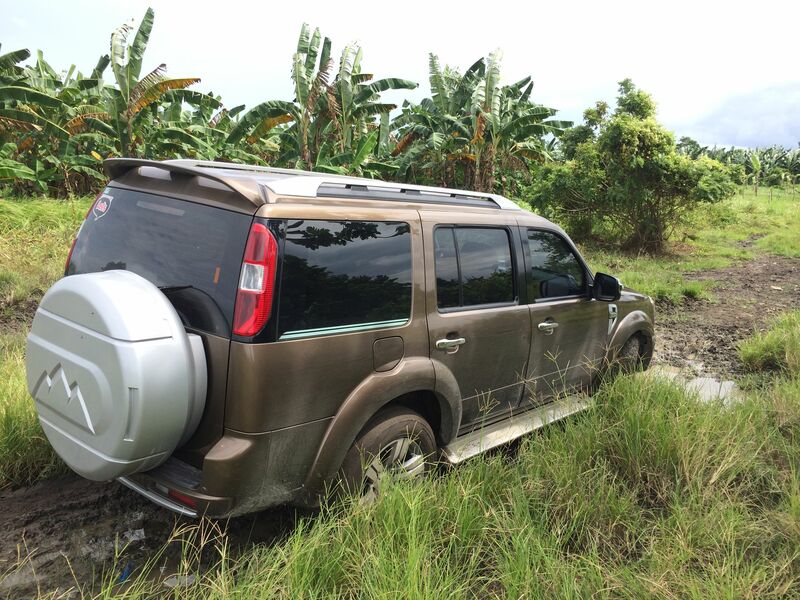 While his sturdy SUV is built for all terrain, it would not budge sinking deeper into the mud. In the company of four female passengers, Andy walked some distance to find help. He found two men to help. We tried pushing only to go deeper. It was much later that a trickling of a few other men came. So there I was grunting and channeling all the muscles I built in the gym to help push. Never mind, if the mud from the tire went straight to my arms and chest. Eventually, we got the car out of the mud, the vehicle and all its passengers filthy and soaked in mushy soil. 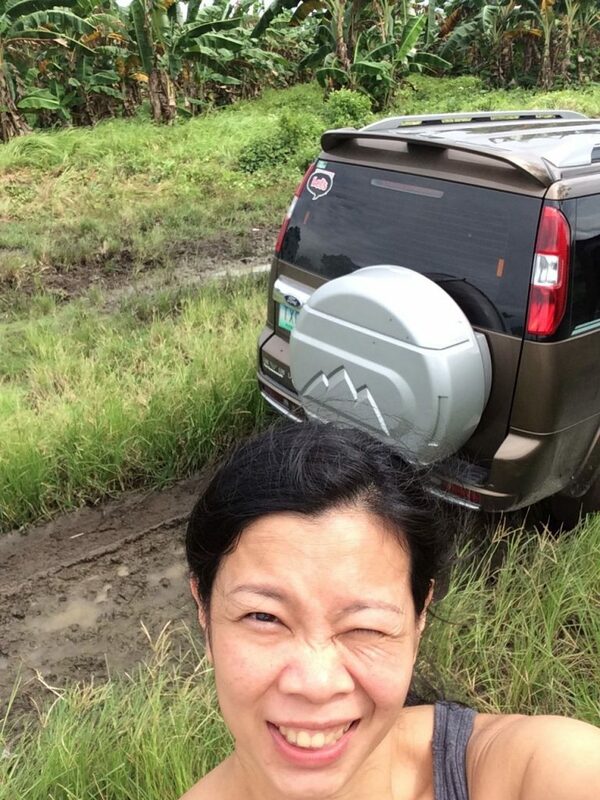 Off Road adventure…. and stuck deep in the mud! When you are stuck in the mud (or even in life), the only solution is to PUSH! But I’ve come to realize, I am a strong woman. Not just physically strong, but also a fierce personality like my legendary Lola Choling. People have called me matapang many times, a word in Filipino, which means strong, courageous, brave, audacious, or even fearless. I may not ride a horse and I’ve never held a riffle in my life. But I do know how to stand up for my rights. I’m no push over. And when people try to take advantage, I do stand my ground. When things get tough and I need an extra dose of fierceness, I will channel my inner Lola Choling. While I may not have accomplished all I had set out to do for my trip, I left Pinamalayan with a deeper sense of my ancestry. I’m not suggesting you all go to my cozy little provincial town. It’s not a tourist destination and internet is very slow. But I recommend going on your own ancestral adventure. Get to know your roots. Learn about those who’ve come before you. Find out the legend of your ancestral town. And if you’re lucky like me, your own adventure will involve believing in rainbows and your own promised land. If you enjoyed this post, may I ask your help. Please share and connect with me on Instagram , Facebook, and Twitter to feed your hunger! Nice blog! Pinamaleño here. Been searching for image of Mindoro Kare-Kare. 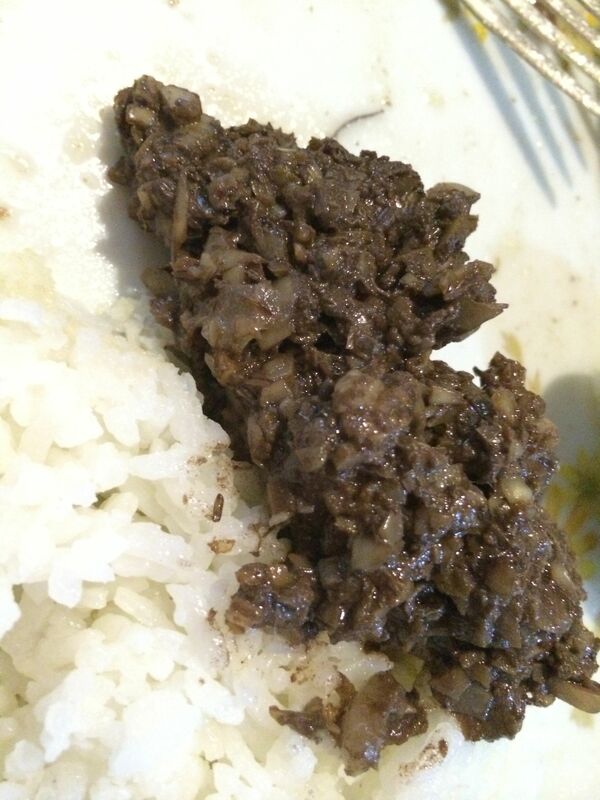 I really want to show this to my friends since this is the Kare-Kare I know since chilhood. Now they can see one! Many Thanks! Thanks to a fellow kababayan for reading my blog. It was my first time to try that Kare-Kare, and yes, it was delicious!